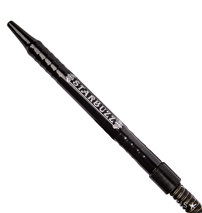 Starbuzz proudly presents the Starbuzz Carbine Hookah shisha Kit for your Hookah smoking pleasure. Step into the future of Hookah smoking with this bad boy as the Starbuzz Carbine Hookah Kit includes all-terrain adjustable length legs for ultimate stability, a heavy duty anodized hose system in matte finish with medical grade silicone, an LED adjustable color changing light with remote control, high grade stainless steel precision carbine tongs, a 360 degree rotating stem that is completely detachable, and a 24mm OD adjustable metal diffuser. Starbuzz is the leader in Hookah innovation and this Starbuzz Carbine Hookah shisha Kit will not disappoint! ***Remote comes with CR2025 Batteries, LED Base takes 3 AAA Batteries (NOT INCLUDED).